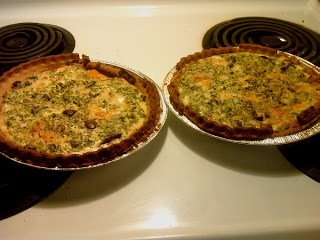 This is a broccoli, kalamata olive, swiss & pepper jack cheese quiche. It's quick and easy, heavenly right out of the oven and even great cold for lunch the next 2 days. Take 1 frozen pie crust and defrost/brown for 15-20 min in oven on 350. Mix 3 eggs, 1c. milk in a bowl. Pour into the baked crust. Crumble broccoli over the top with the olives and on top add the shredded cheeses. Sprinkle salt, pepper and nutmeg on top of mixture. 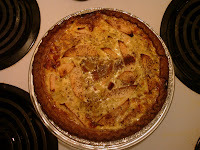 Bake at 375° for about 30 minutes, or until quiche filling is set and top is lightly browned. Follow same steps but instead of previous ingredients use boiled and squeezed baby spinach, thinly chopped boar's head ham, munster cheese, and pan cooked onions. Follow same steps but instead of previous ingredients use apples, Finlandia sliced swiss and diced ham.